Dr. David G. Edwards and his wife Linda Forbes-Edwards established this scholarship in 2015 to help lift the financial burden off of students at West Liberty University. Edwards graduated from West Liberty with a bachelor’s degree in biology. He and Linda married and moved to Morgantown, where he would earn a master’s in biology and a Doctor of Dental Surgery from West Virginia University. 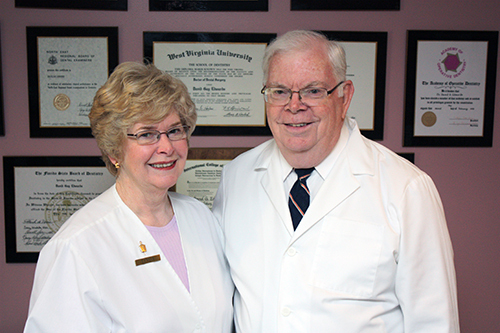 The couple moved back to Wellsburg to start their dental practice. He served as a clinical assistant professor for the WLU School of Dentistry from 1996 to 2005. Edwards then served two five-year terms on the West Virginia Board of Dental Examiners, serving as president for three years. Locally, he has been involved with the Wellsburg Lions Club, the United Way, the Hancock-Brooke-Ohio Victim Assistant Program, and the Wellsburg First Presbyterian Church. In 2013, he was named one of the WVU School of Dentistry’s Distinguished Alumni, he is a member of the WLU Alumni Wall of Honor, and he is a recipient of the Pierre Fauchard Academy’s Outstanding Dentist Award. Eligible students must be rising senior biology majors maintaining a 3.0 or higher grade point average. Their goal must be to enter either the dental or medical professions after graduation. Students must be residents of West Virginia, and priority will be given to Brooke County residents. West Liberty University science department faculty members will choose scholarship recipients. Selected students in the College of Sciences will receive a scholarship totaling $1,000.